We’ve already parsed through 2013’s cable news ratings, which showed Fox emerging victorious another year with CNN in second (for many categories) and MSNBC in third (but placing second in several breakdowns). For total day viewership (6 a.m.-6 a.m.), we noted that CNN moved into second place, with MSNBC not too far behind. But when you remove MSNBC’s crime documentaries series — which constitute an unusual break from the network’s editorially progressive political content — their demo ratings (A24-54) sink lower, handing that category over to CNN as well. 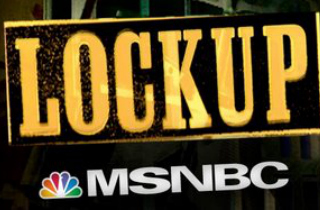 When you include MSNBC’s series Lockup, Caught on Camera, Undercover, Predator Raw, and To Catch a Predator in the network’s all-day (6a-6a) viewership, they rack up 133k in the key demo, placing just a thousand demo viewers ahead of CNN. 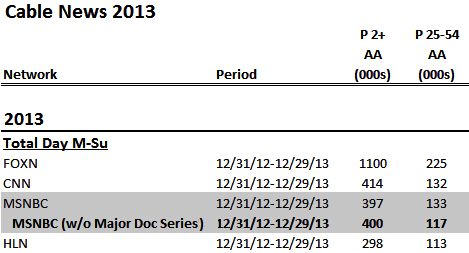 The aforementioned prison/crime series played a heavy role in MSNBC’s holiday airings which boost their overall ratings. The network ran those programs all day Christmas, all day New Year’s, and much of Christmas and New Year’s Eves. They also tend to air every Friday, Saturday, and Sunday nights from 10 p.m. until 5:30 a.m. This is significant because neither Fox nor CNN devote anywhere near this amount of time to airing taped tabloid/crime programming.